I had the extreme pleasure this weekend to be in an audience filled with children’s book writers at the SCBWI conference. 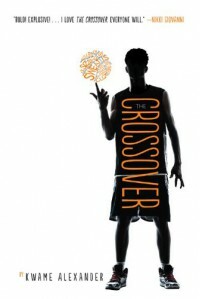 The culmination of this event was a keynote by the recently named Newbery winner, Kwame Alexander. Now I am a huge fan of this prize, as it is given to my favorite kind of read-aloud book, but I was not familiar with Mr. Alexander’s work, and had mixed expectations. That morning, before his speech, I debated whether I should buy one or two copies of his book. For the past few years I have been right on track with the winners — started to consider myself a good judge of what would win — so I was a little humbled to admit this book was completely off my radar. In the end, I pitched my doubt and went all in on my purchase, four copies, recipients to be named later. The book has a sleek cover, made even cooler by the newly-applied sticker that had been shipped in for this event, the first group of books to bear the Newbery seal. We are his first audience after the award was announced this week. So. Mr. Alexander speaks, and I am in awe. It was a Sunday, and trust me, he took us to church. Say YES, he told us. (part Poet, part motivational speaker) No is only the stuff you have to get out of the way to make room for the yes. He tells how he wanted to be a poet so badly that he took himself on a 30-city tour to spread the word. Literally. How he never wrote a picture book before, but when someone asked him to do one, he said YES. He says all of this to us, and we lap it up, we write it down, we tweet it out into the ether. He walks about and he performs his poems of love, of loss, of pain and we are filled up. And when I get home that night, despite how keyed up I am, how very motivated I am, I do not sit at the keyboard and write. No. I say YES to Kwame Alexander and I kick off my shoes and I curl up in my most comfortable chair and I READ. And I do not get out of that chair again until I turn the last page and wipe the tears from my eyes and breathe a heavy sigh. And I think, YES. That is truly what it is all about. Thank you, Kwame Alexander. You are, as you always dreamed, an amazing poet, and I, for one, am so very grateful to be a reader.